For two years, Gerri Gilbert, Andy Jamison, and Sonja Johanson, neighbors in a Mill Valley, California, community, have begun their days with a power walk. Their routine changes suddenly one morning when Andy, fed up with the immaturity and infidelity of her decade-younger second husband, throws him out in an angry, loud, public scene. The timing may be unexpected, but her friends know that Andy’s marriage has been flashing an expiration date since the honeymoon glow dimmed. But when, a bit later, Gerri asks Phil, her husband of almost twenty-five years to move out of their family home, everyone is shocked, including Gerri herself. The Gilberts appear to be the perfect suburban family. Gerri, a supervisor with Child Protective Services, and Phil, an assistant district attorney, are good at their demanding jobs, skilled at balancing all the responsibilities that come with being the parents of three teenagers, and secure in their marriage. Gerri’s menopausal mood swings may have her family wincing at her bursts of temper, but no one doubts that Gerri and Phil love one another. They are best friends who talk to one another, laugh together, and have one another’s back. All of this is threatened when Gerri discovers that Phil had an affair. It doesn’t matter that the affair is five years past or that Phil sincerely regrets it. What matters is that Gerri can’t forgive him for the betrayal or for making her doubt herself and the relationship that was the bedrock of her life. Sonya, a feng shui consultant and home organizer who strives for a balanced life through vegetarianism, exercise, and meditation, finds her troubled friends less than receptive to her New-Age remedies, but it is not until her husband George walks out, declaring that he wants a life that includes red meat, alcohol, and freedom from feeling “like a Chia pet,” that Sonja jettisons her herbs and water fountains and sinks into a paralyzing depression. It is BJ Smith, an intensely private newcomer to the neighborhood who has not responded to overtures of friendship, who suspects something is wrong and persuades Gerri to use her key to check on Sonja. BJ’s intuition allows Sonja to get the help she needs and saves her life. Meanwhile, Andy has found the most satisfying relationship of her life, emotionally and sexually, with the contractor remodeling her kitchen, an improbable romantic match for a woman with Andy’s history of involvement with hot, toned, younger men. These women survive their individual crises, confront truths about themselves that they uncover in the process, and learn that the support and loyalty of real friends help to heal the necessary wounds and to inspire the courage to move in new directions. Carr leaves small-town romance to craft this women’s fiction novel about friendship and marriage, but she maintains her deft touch at creating characters whose credibility and complexity engage her readers. I first read Robyn Carr’s books in the early 80s, but it was The House on Olive Street (1999), her first women’s fiction title, that put her on my auto-buy list. All of her titles in this genre have had a depth, a warmth, and a reality that made me treasure them. There is no one better than Carr at showing the role female friendships play in helping women move through the crossroads experiences. 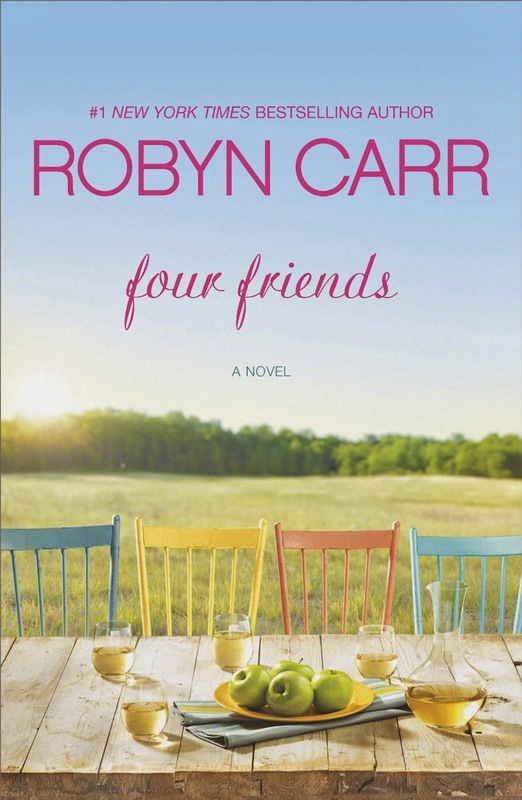 Four Friends is a welcome addition to Carr’s women’s fiction books. If you are a fan of books about women and their friendships or if, like me, you are a Robyn Carr fan regardless of genre, I recommend this book. Note: I don’t want to include spoilers, but for readers who are leery of women’s fiction because the books can have endings that provide little resolution, Four Friends ends on an optimistic note. I really enjoy her books and would love to read this one! Thank you, again, for another interesting review. I enjoy Robyn Carr's books, but have not tried her women's fiction. That will change. Yes, I enjoy romances with their "guaranteed" HEA. At the same time, I am among those of an age who realize there are often unhappy endings to the HEAs. Life and reality often get in the way to derail lives and romance. It is good to see what that does to a person and how it can be overcome. I will be looking for FOUR FRIENDS and THE HOUSE ON OLIVE STREET which is probably buried in my TBR mountain. Pat - The House on Olive Street was a few years back, and it was really good! I was nervous about the HEA aspect of the current book, so thanks, Jenga, for the info about the upbeat ending.